SPAIN, Castile and Leon. Juan (John) I, AD 1379 to 1390. Silver real. Denomination : Silver real. Mint : Sevilla. Date : 1379 to 1390. Size : 27.7 x 28.3 mm. Weight : 3.43 grams. Grade : aXF and very well struck. 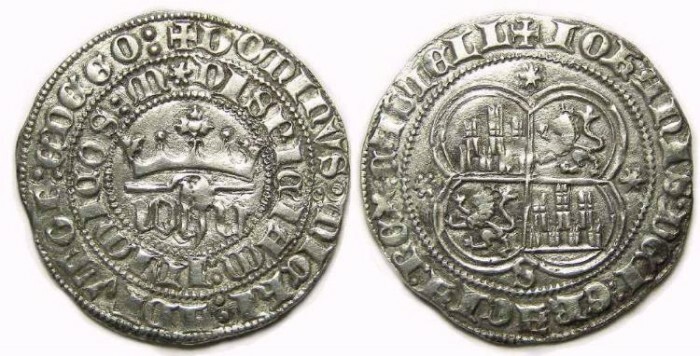 Obverse : Crowned IOHN, with two rings of inscription. The inner ring reads DISPICIAM INIMICOS M and the outer ring reads DOMINVS MIChI ADIVTOR EDCGO. Reverse : Arms of Castile and Leon with stars to the sides and above, with an SIOhANIS DIE GRACIA REX CASTELL around.